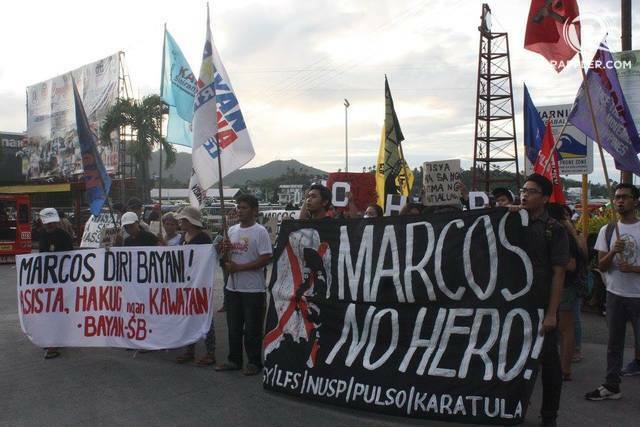 TACLOBAN CITY, Philippines – Protesters here, the home town of former first lady Imelda Marcos, joined the nationwide indignation activities on Friday, November 25, against the burial of her husband Ferdinand Marcos at the Libingan ng mga Bayani. 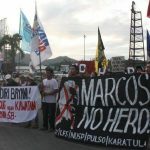 They called for the exhumation of Marcos’ remains from the Heroes’ Cemetery, saying he does not deserve a place there due to the human rights violations committed during his dictatorial reign. “We want to express our strong opposition to the recent burial of former President Marcos, and we want to show that Eastern Visayas, especially Tacloban, is not a Marcos country nor a Romualdez country,” said Rey Miranda, secretary general of Bagong Alyansang Makabayan Eastern Visayas, which led the rally. Petitioners with the Supreme Court, who lost their case when the tribunal upheld President Rodrigo Duterte’s order for the burial, had filed at least two followup petitions after the Marcoses and the military rushed the former president’s interment while the ruling was not yet final and executory. The one filed by former Bayan Muna congressional representatives Satur Ocampo and Neri Colmenares asks the High Court to hold in contempt the Marcos family and the armed forces leadership, and for the Marcoses to return the public funds used for the burial. The other one, filed by Albay Representative Edcel Lagman, outrightly asks the Court to order the exhumation of Marcos’ remains. About a hundred protesters – including students from University of the Philippines Visayas-Tacloban City and representatives of different sectors – marched from UP to the downtown area at around 4 pm. Joshua Sagdullas, a student leader from UPVTC, said the protests happening in various parts of the country are not about supporters of only two families: the Marcoses who abused their power, and the Aquinos who helped lead the fight against them. The youth, among others, should be involved, he said. “We should organize, make a move, own the street,” he said. Participants from Northern Samar recounted their experiences during Martial Law. Forty-five men, women, and children were killed in the province during the Marcos regime, they said.